Savvy Spending: FREE Chobani Printable Coupon! 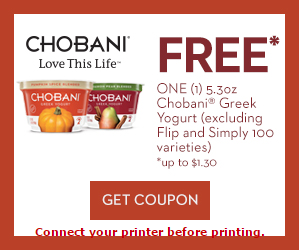 You can print a coupon valid for a FREE Chobani Yogurt 5.3 oz (up to $1.30 max value!)!! Hurry and print before it's gone!